The Thursford Collection is situated near Fakenham in Norfolk, England. It houses a magnificent collection of steam showman’s and traction engines, steam rollers and static engines, fairground and dance hall organs and a Gondola switchback. It also includes a 2′ narrow gauge steam railway and a mighty Wurlitzer theatre organ. The Wurlitzer came from the Paramount, a 3500 seat cinema in Leeds where it was installed in 1932. It is made to be one of the main attractions in the Collection with live concerts every afternoon in the summer months with the Resident Organist, Robert Wolfe, at the console. The organ was opened at the Thursford Collection by Arnold Loxam in 1976. 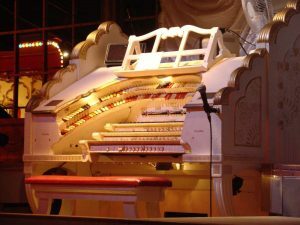 One of only two ‘Balaban 4’ models exported to Europe by Wurlitzer (the other being for the Paramount Newcastle, later installed at Turner’s Musical Merry-go-round, Northampton). the Thursford instrument is equipped with the unusual ‘Modernistic’ style of console.